You are here: Home » News & Articles » Volunteer EMT’s Severe Back Pain Gone! Volunteer EMT’s Severe Back Pain Gone! 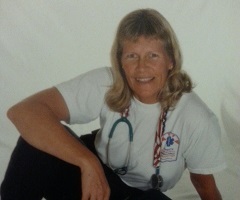 Volunteer EMT & Skilled Nurse Janice has dedicated her life to helping others. Her love of helping others meant she didn’t always take the time to practice proper lifting mechanics, which many times left her driving home in tears from the severe back pain she was suffering from. After years of dealing with the pain she was recommended to NeuroScience & Spine Associates by a co-worker. Janice had already seen another specialist who suggested a more invasive procedure, but she decided to consult with NeuroScience & Spine Associates Physiatrist Dr. Robert Roberts. After consulting with Dr. Roberts she immediately felt a sense of comfort with him and the NeuroScience & Spine Associates team. The end result of her consult was an RF Ablation of the Lumbar Spine performed in The Center for Spine Care by Dr. Roberts and his team. The immediate relief Janice received has changed her life! I highly recommend NeuroScience & Spine Associates to everyone I know that might benefit from their expertise. They gave me my life back … I only with I would have gone to them years ago! Are you suffering from head, neck or back pain and don’t know what to do? Set up an appointment today and we can help!